Minister of Finance Curtis Dickinson tabled the Economic Substance Bill in the House on Friday, with the Ministry saying the intention is that the legislation — which seeks to “enhance provisions relating to economic substance for registered entities” — will be in force by 31 December 2018. Last year the Council of the European Union named 17 jurisdictions as “non-cooperative tax jurisdictions”; with American Samoa, Bahrain, Barbados, Grenada, Guam, South Korea, Macau, Marshall Islands, Mongolia, Namibia, Palau, Panama, Saint Lucia, Samoa, Trinidad and Tobago, Tunisia and the United Arab Emirates included on the original list, with the list changing as nations meet commitments set by the EU. Bermuda, while not listed as a “non-cooperative jurisdiction,” was placed on a secondary list along with over 60 other nations and territories. “The Council of the European Union adopted a resolution on a Code of Conduct for business taxation with the objective of curbing harmful tax competition aimed at jurisdictions with low or zero rates of corporate income tax regimes, such as Bermuda, BVI, Cayman and the Crown Dependencies. In response, the Government made a commitment to implement reforms by December 2018,” a Ministry spokesperson explained. “As such, Bermuda registered entities [local and exempted] that carry out the relevant activity will be required to meet economic substance‎ requirements as provided in the legislation and related regulations. “The Government of Bermuda remains fully committed to ensuring that Bermuda will not be on any EU list of non-compliant jurisdictions and our position is supported by the BMA, the IAC, ABIC and ABIR, and all sectors of Bermuda’s international business community,” said Minister Dickinson. “This legislation is important to Bermuda, our revenue base and our status as a blue-chip jurisdiction. Significant work has been carried out by the Government in consultation with a focused group representing a cross section of in-scope industries to develop the draft legislation. The Ministry added, “For certain regulated industries where the applicable regulatory framework already include having substance requirements in Bermuda, it is expected that compliance with those existing regulatory requirements will be sufficient to evidence compliance by those entities with the new economic substance regime. “This new legislation will also include detailed provisions related to the monitoring and enforcement of the economic substance requirements. Specific sanctions for non-compliance will be set out, as well as the process for notification of such non-compliance. Earlier this week the Minister of Finance Curtis Dickinson along with the Junior Finance Minister Wayne Furbert attended a Government briefing on economic substance legislation at the offices of AXA XL, as pictured below. 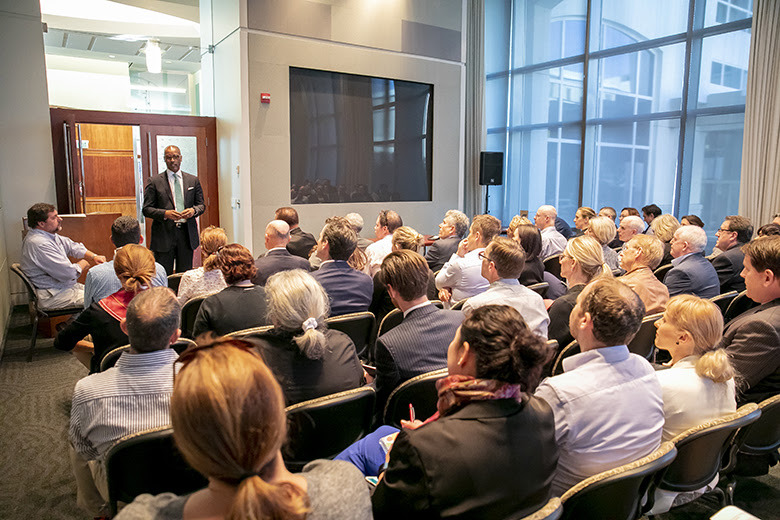 The Executive Director of the Association of Bermuda International Companies [ABIC], Mr. Richard Winchell, invited the Bermuda Government to provide a briefing and approximately 90 invited guests of ABIC were present. Premier Burt said, “After discussions in Brussels, that a recent announcement by the OECD that its Forum on Harmful Tax Practices will eventually replace the EU’s 2.2 substance regime and, on coming into force, the substance rules will no longer be an EU standard but will be a global standard.